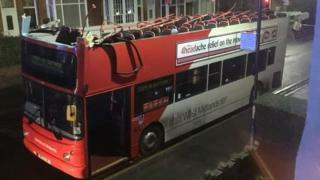 The roof of a double-decker bus was torn off when it passed under a low railway bridge. The top of the vehicle was "completely removed" when it went through the tunnel in Bournville Lane, Birmingham, according to a paramedic who attended. 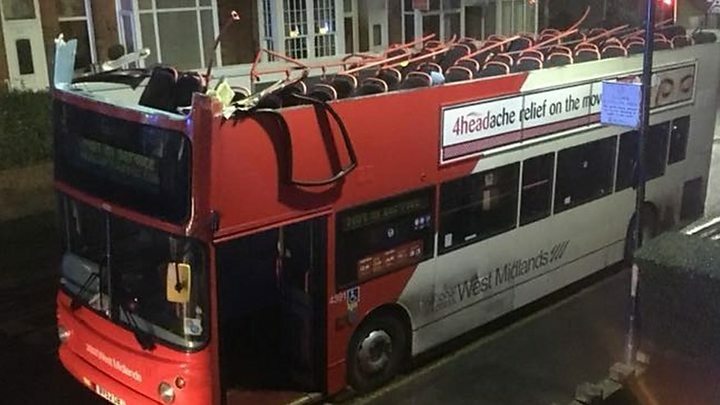 Photos show extensive damage to the National Express West Midlands bus, which was out of service at the time. No passengers were on board and the driver, in his 30s, was not injured. The bridge, near Cadbury World, bears signs warning of a 10ft (3m) height limit. West Midlands paramedic Ben Pallante, who was called to the scene, said it marked an "unusual end" to his shift. A fire crew from nearby Kings Norton simply described the crash as a case of "double decker v bridge. Bridge wins". A spokesman for National Express said it would be investigating what happened.